O'Haire, M. E., McKenzie, S. J., Beck, A. M., & Slaughter, V. (2013). 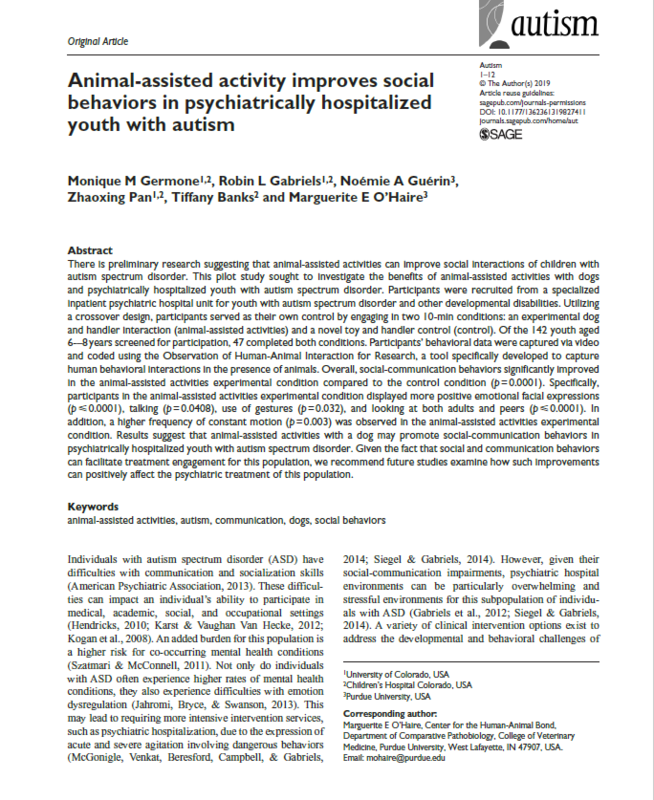 Social behaviors increase in children with autism in the presence of animals compared to toys. PloS one, 8(2), e57010. Guérin, N. A., Gabriels, R. L., Germone, M. M, & O’Haire, M. E. (2016). 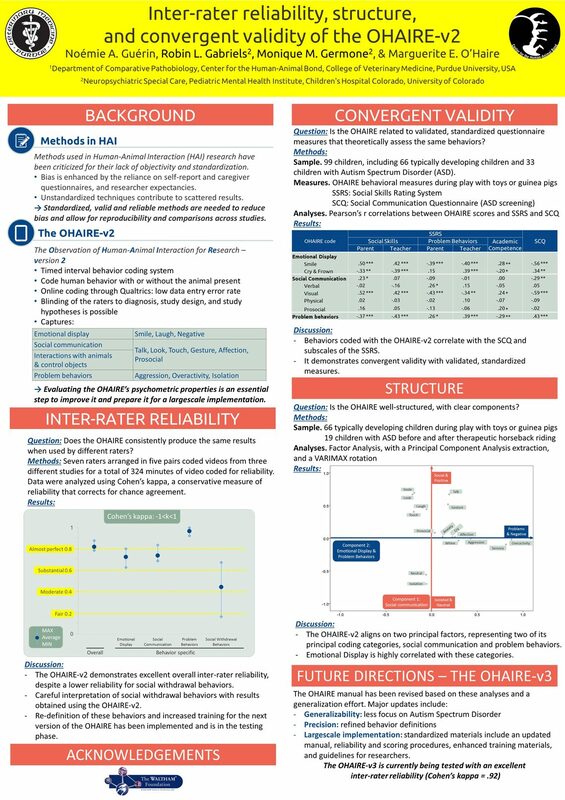 Inter-rater reliability, structure, and convergent validity of the Observation of Human-Animal Interaction for Research, version 2 (OHAIRE-v2). 14th Triennial International Association of Human Animal Interaction Organizations (IAHAIO) Conference. July 11-13, Paris, France. Guérin, N. A., Gabriels, R. L., Germone, M. M., & O’Haire, M. E. (2017). 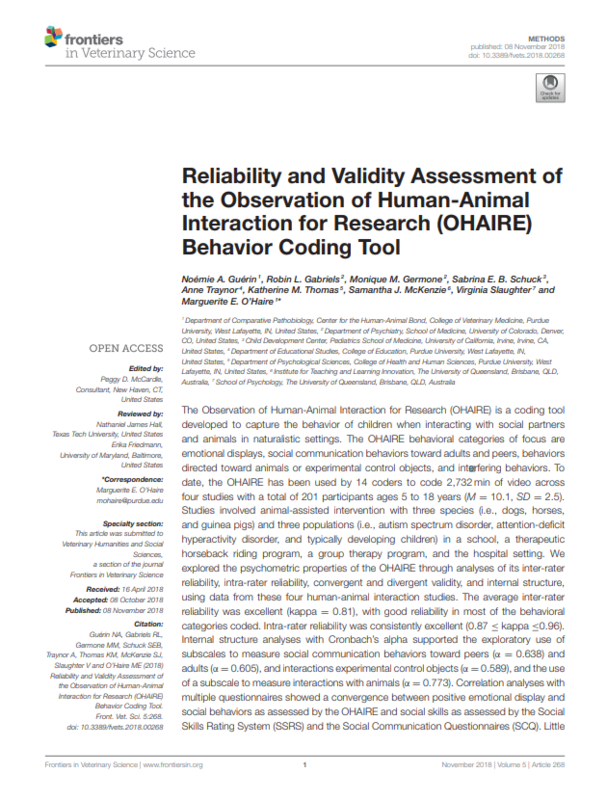 Inter-rater reliability, structure, and construct validity of the Observation of Human-Animal Interaction for Research, Version 3 (OHAIRE-V3). 26th Annual International Society for Anthroozoology (ISAZ) Conference. June 22-25, Davis, CA, USA. Guérin, N. A., Gabriels, R. L., Germone, M. M., Schuck, S. E., Traynor, A., Thomas, K. M., McKenzie, S. J., Slaughter, V., & O’Haire, M. E. (2018). 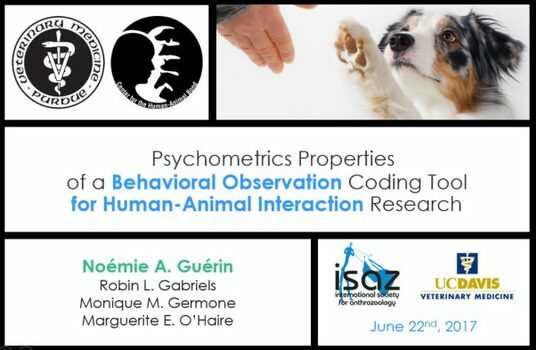 Reliability and validity assessment of the Observation of Human-Animal Interaction for Research (OHAIRE) behavior coding tool. Frontiers in Veterinary Science, 5, 268-282. Germone, M. M., Gabriels, R. L., Guérin, N. A., Pan, Z., Banks, T., & O'Haire, M. E. (2019). 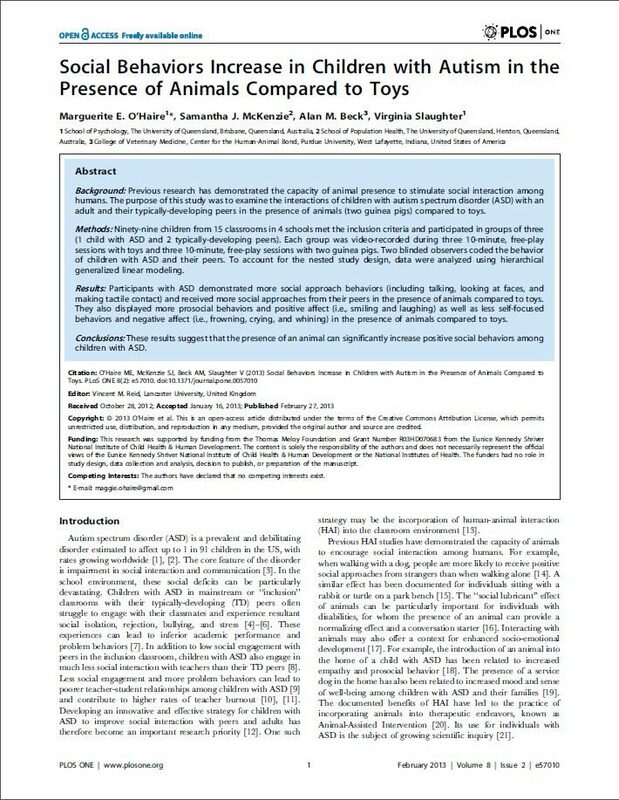 Animal-assisted activity improves social behaviors in psychiatrically hospitalized youth with autism. Autism. © Copyright © 2018 Marguerite E. O’Haire, Robin L. Gabriels, Monique M. Germone, and Noémie A. Guérin. All rights reserved.